Your shopping cart is currently empty. Please revisit the item and select add to cart. Thank you the Water Cannon Staff. Water Cannon is a leading online discounter of aftermarket replacement small engine parts that fit Honda GX Series including our competitively priced fuel tank assembly. 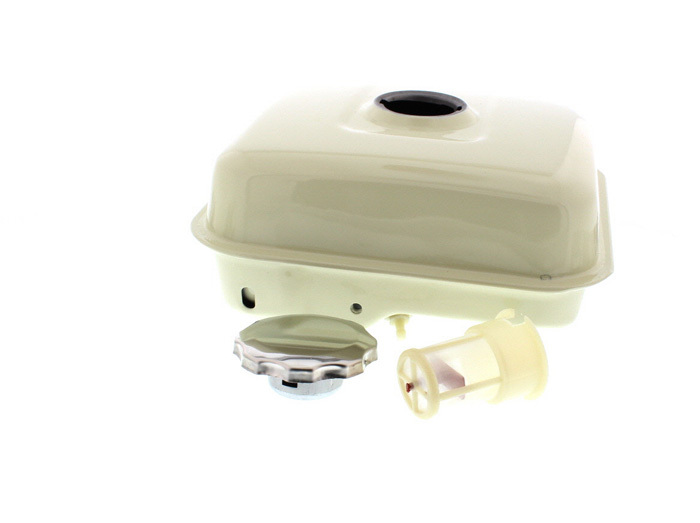 The fuel tank assembly includes: tank, cap, filter & outlet valve. The fuel tank stores fuel in preparation for mixing by the carburetor and use by the engine. This heavy duty aftermarket fuel tank assembly was specifically designed to meet or exceed the ridged specifications of the Honda GX Series. This quality fuel tank assembly is specifically designed to fit the GX140, GX160, GX200 Honda Engines. Save 20% when you buy 6 of the same sku number and enjoy free shipping on orders over $35. Water Cannon supplies high quality aftermarket fuel tank assembly for Honda GX Engines. GX Parts ships via UPS with delivery to the lower 48 states of the United States. When you purchase any items from GX Parts, we will email you a receipt with tracking information so you can track your shipment. We are currently offering FREE SHIPPING and handling on PREPAID orders over $35.00. * This free shipping rate applies to prepaid orders only, paid via credit card, fax checks, etc. For orders placed by phone or online that are under $35.00, a shipping charge of $15.30 will be applied. Click here for information on international shipping and our shipping policies. 4300 W. Lake Mary Blvd. Get the scoop on discounts, new products and more! Copyright © 2017 Water Cannon, Inc.
Are you sure want to Finish Order?